Excellent for sgraffito, embossing, and tole painting. Use with polymer clay for drawing smooth lines and decorations before baking. Tools are approximately 5½" (14 cm) long. Each ball end is made of stainless steel, treated for hardness, and set in a smooth hardwood handle. Large — measures .072" in diameter (1.8 mm), and has a ball end that measures .114" (2.9 mm). 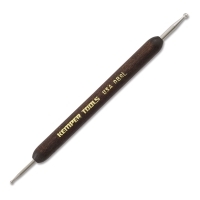 Small — measures 0.3" in diameter (0.8 mm), and has a ball end that measures .045" (1.1 mm). Regular — measures 0.45" in diameter (1.1 mm), and has a ball end that measures .072" (1.8 mm).